Well, I think it’s safe to say after my June/July reading slump/you know, defending my PhD thesis and moving to California to do fieldwork, I finally got bit by the reading bug again. I actually have to blame readathon vlogs, which I have been loving on YouTube and find super motivating to watch. They definitely make me want to read all the things, so here are the 12 books I’ve finished so far this month. Honestly, I picked up On the Day I Died: Stories from the Grave by Candace Fleming because years ago when it was first released (2012…) I failed to read the advanced ebook before it was published and I always want to go back and read those books and review them. I saw it was also available as an audiobook from my library, and it was a pretty short one, so I decided to give this collection of short stories with a paranormal/horror twist a try. 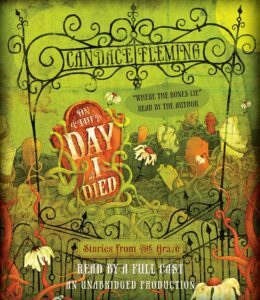 All ten ghost stories in On the Day I Died take place across the last century and a half in the Chicago area, and there’s always a bit of truth mixed in–which Fleming explains at the end of the book. It’s a fun mix of history and the paranormal, but definitely not something I found scary. That said, it is likely best suited to the intended middle-grade audience who would hopefully enjoy it more than I did. While I found the book a bit boring at times, I did really like the audiobook, because there was a different narrator for each story and the cast was great. Overall, I’m not rushing to pick up anything else by Fleming, but On the Day I Died would be a fun book to read or listen to around Halloween. 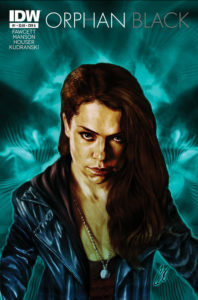 I loved the Saga graphic novels so much I really wanted to find another series to fall in love with while I wait for another book, so that lead to me trying out Orphan Black #1 by John Fawcett, Graeme Manson, Jody Houser and Szymon Kudranski. I’m a big fan of the two seasons I’ve watched of the TV series–I plan to finish it, but they took it off Netflix–which is definitely who these books are aimed at. Orphan Black #1 would not make any sense if you hadn’t seen the show and the graphics are nice but it doesn’t add anything to the story either. Plus, 30ish pages isn’t enough to tell much of a story. Instead, it feels like the authors didn’t try and just relied on the fact that fans who like the show would like this. I’m tempted to pick up the next ones just because they are so short–each one focuses on a different clone, with this being Sarah’s story–but I know I’m better off saving my time to watch the TV show instead. Never thought I’d write that! 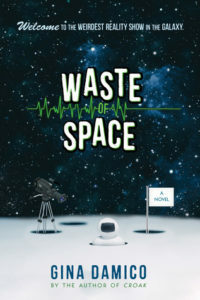 Waste of Space by Gina Damico is definitely one of those books I blame for my reading slump, but I had already invested a couple hundred pages in it, so I just didn’t want to give up either and I finally finished it this month. Finally. I really enjoyed Damico’s debut series, Croak, which was a fun Dead Like Me trilogy, but hadn’t tried any of her later books until Waste of Space. This book is about a reality television show where they pretend to cram 10 teens into a spaceship, and use a lot of special effects to convince them they are really in space. But then, communication is severed and the teens must figure out what to do next. The novel itself is told in a mix of transcripts of various kinds, which is usually a format I enjoy (see, Illuminae) with a heavy dose of satire. The reason that Waste of Space didn’t work for me and Croak did, is that I just didn’t care about any of the characters at all in this book. And 500+ pages is a long time to not care about the characters you are reading about, especially when they are supposed to be in some kind of life-threatening danger. Then, when it finally, finally, got to the end, the “twist” just felt dumb. In fact, a lot of the story was pretty dumb and boring, even when it was supposed to be satirical. I think Damico was trying to break down stereotypes, but it took far too long for that to happen, and the book just moved really slowly. If I sound grumpy, it’s because I am really annoyed by what waste of time Waste of Space was, so even though I’d like to read her other books, it will be awhile before I pick up another Damico novel. 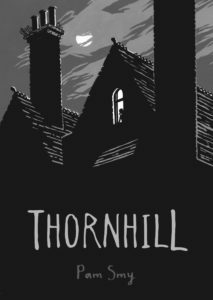 Thornhill by Pam Smy tells two parallel stories, the first one takes place in 1982 through the diary entries of Mary, a bullied orphan at the Thornhill institute, while the other occurs in 2017 through wordless imagery when Ella moves to a new town and discovers Thornhill. I was really intrigued by the concept of this book, but while I appreciated the format, the story itself was not terribly original. Despite the hardcover being 544 pages (I read the ebook) Smy’s novel was easy to read in one sitting and would be a nice pick for older but reluctant readers which could also foster some discussion about bullying. It does have some creepy moments, but it also feels like it is trying to hard, such as by making the mute girl’s favourite hobby talking to her handmade puppets. The writing also felt really dated, I kept having to remind myself it took place in 1982 and not a century earlier. That said, Thornhill is a really sad story and even though it feels generic at times, the very creepy and upsetting ending was perfect. 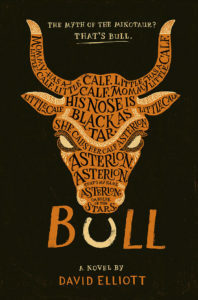 Definitely one of the most surprising books I’ve read lately is Bull by David Elliott, a mythology retelling of Theseus and the Minotaur in verse. It was really different than the many other novels in verse I’ve read–I just love the format–and reminded me more of spoken word poetry. It was interesting because at the end of the book, Elliott explains the different poetic formats used for each character’s voice, and his style worked so well I didn’t even notice it until he explained it. Even though Bull is described as a retelling, it’s actually more like a regular telling in verse with contemporary language, and more details/backstories not in the original myth. The story itself is dark, comical, and sad, and a bit graphic at times. I saw a comparison to Deadpool, and I think that’s quite accurate (although I didn’t actually like Deadpool). Bull is quite short and with the verse format, it’s an extra quick read, but the pacing was great, the writing was a lot of fun, and overall I just really enjoyed this book. Do you ever pick up a book because you’re glad it exists, but then soon after realize that doesn’t actually mean you’ll love reading it? 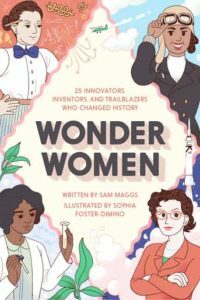 That was my experience with Wonder Women: 25 Innovators, Inventors, and Trailblazers Who Changed History by Sam Maggs. The path that lead to me getting my PhD in Biology started with some strong female role models, so I loved the idea of 25 short biographies of lesser known but impressive historical figures, but I honestly had a really hard time reading it. While the history aspect of each biography was really interesting, something about the book had a hard time keeping my attention and I was often bored. The short biographies mean there’s not a lot of depth to them, and Maggs writes with a lot of dry sarcastic jokes in a very casual tone. I appreciate the effort, because I know it’s trying to make the work more accessible, but since I’m a decade older than the intended audience, it didn’t quite work for me. Ultimately, I really think that Wonder Women would be an important addition to any library or classroom, because it is a great resource for picking up and reading one biography at a time–for me, it just didn’t quite work as a binge read. I will definitely be passing on my copy to teens. In my quest to read “books I’ve owned forever and want to get off my shelf”, I finally read Love and Other Perishable Items by Laura Buzo. This is an Australian coming-of-age YA about 15-year-old Amelia, who works at a grocery store and falls in love with Chris, who also works there but is unfortunately 21. Despite the large age gap, they have a genuine friendship. But Amelia still hopes of something more. 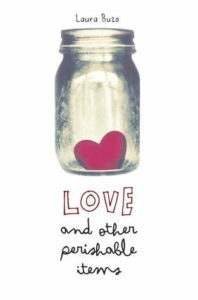 Love and Other Perishable Items tells the same story from both Amelia and Chris’ perspective, which is usually not something I enjoy, especially since it is really repetitive in terms of plot in this case, but in this case it’s also really about characters and not plot, so I enjoyed it. I really loved the character of Amelia, who is introspective, without seeming unrealistic. Buzo’s book is slow-moving but I really just think the writing is so good and charming. I’m not sure if I love it because it’s Australian, but it definitely felt different than a lot of YA, even if the plot wasn’t that unusual. That said, considering the many ways that the storyline could have gone, I really appreciated the ending. I’ll definitely try to pick up Buzo’s other novel, Holier Than Thou, if I can track it down in Canada in the future. I read the Clan of the Cavebear series when I was inappropriately young, so I was quite intrigued to read The Last Neanderthal by Claire Cameron, the author of the emotional novel The Bear, which I really enjoyed and featured in my February 2014 reading roundup (which was much shorter than they are these days…). The Last Neanderthal takes place 40,000 years ago and tells the story of Girl, the oldest daughter in a family living in a harsh landscape, and in the modern day, as Rose, an archaeologist, works to excavate two newly discovered bodies. Like last time, I really loved Cameron’s writing in The Last Neanderthal: it was intense and emotional at the same time. Both stories were compelling in their own way, while there was a clear connection between them, I struggled with having both in the same book. One story was always left on a cliffhanger before switching to the other, and I found it really distracting. The cliffhangers were the worst for the modern day portion, so I ended up skipping ahead to find out what happened, but by the end of the book I ended up wishing Cameron had just focused on the past. I though her exploration of the Neanderthal life was really intriguing and well-written, and I wish she had stuck to that so I could stay immersed in that world. 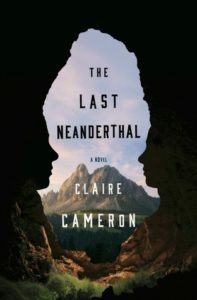 Still, The Last Neanderthal definitely reconfirmed my commitment to read any future novels by Claire Cameron, and I will be curious to see what unusual world she explores next. It has been way too long since I read a Scott Westerfeld book, but even though I own his most recent novel (Afterworlds) it just didn’t intrigue me enough to pick up. That said, in general, I’ve loved his books and Spill Zone, Book 1 written by Scott Westerfeld and illustrated by Alex Puvilland, makes my 10th Westerfeld. Very few other authors I can say that about! 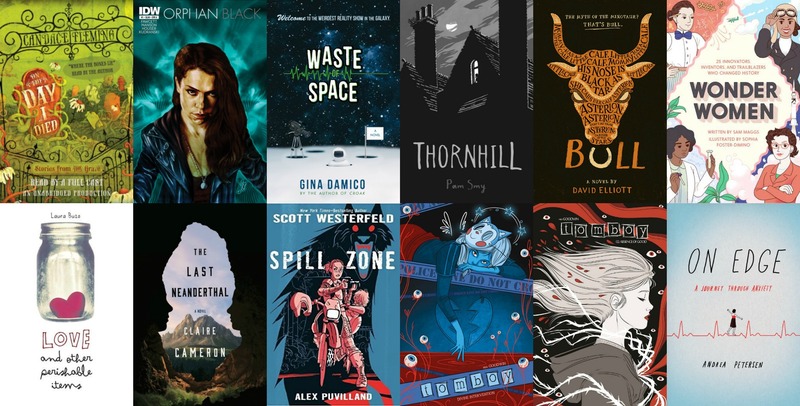 Spill Zone is graphic novel, which tells the story of a small city that was destroyed by a mysterious event, and now is filled with all kinds of creepy danger for anyone who enters the Spill Zone. Addie is responsible for her little sister Lexa, who hasn’t spoken since the Spill claimed their parents. To make money, Addie sneaks inside the Spill Zone and takes photos, eventually get an offer that will tempt her to break all of her rules about entering the Spill Zone. 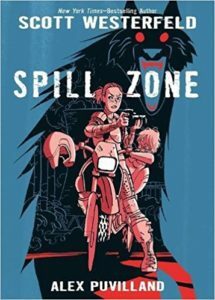 I’ve been on a graphic novel kick this year but even if I wasn’t, I really just adored The Spill Zone. It was the perfect mix of weird and creepy I expect from Westerfeld, with an emotional story to pack it up. The art is a slightly messy style, but it fits well with the story itself. There is a lot of world-building that has to happen in book 1, but it left me rooting for Addie and really wanting to know what happened to cause the Spill Zone, and what will happen next. I cannot wait for book 2! 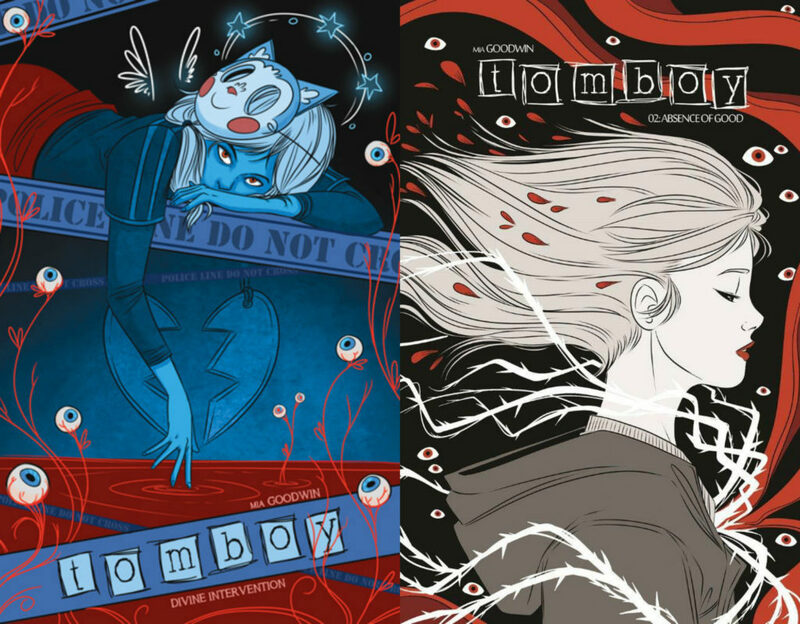 If you are looking for some violent, creepy and exciting graphic novels, I definitely recommend Tomboy Vol. 1: Divine Intervention and Tomboy Vol. 2: Absence of Good by Mia Goodwin. Divine Intervention begins with Addison, whose best friend is killed leading her down a path of vigilante justice murder, cover-ups, and family secrets. There’s also a bit of a supernatural twist to the story. The plot is really engaging and the art is well done. I really don’t feel like the covers–especially Volume 1–are representative of the books, but I though the art inside was great. In Absence of Good the action picks up even more, and I am definitely hoping my library gets Volume 3 so I can pick it up soon! 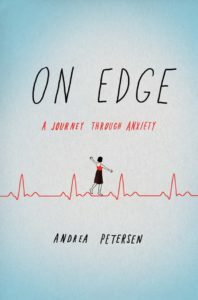 I am always interested in books about anxiety, so On Edge: A Journey Through Anxiety by Andrea Petersen easily caught my attention with the promise of combining science and memoir. In reality, this book is primarily about the research on anxiety, and much less about Petersen’s own personal experience, although tidbits are interwoven. Although I appreciate how well-researched the book is, I really wish that Petersen had spoken more about her own journey. The parts where she did–such as what happened to her grandmother/how she worried that would impact her, as well as how anxiety impacted her pregnancy and parenthood–were my favourites. On Edge actually reminds me a lot of My Age of Anxiety by Scott Stossel (reviewed here), but this book is much less dense and easier to read. While Petersen’s novel contains a lot of history, it is more focused on recent scientific study in comparison to Stossel’s. Like Stossel, there are definitely some moments that could be triggering, but Petersen’s perspective does seem more optimistic to me and I really appreciated her honest discussion of what things worked to help with her anxiety. While I overall enjoyed On Edge, it was a slow read with more stats than I would have liked/can remember. That said, even though I wanted more of Petersen’s life in the book, On Edge is definitely a valuable resource and as long as you aren’t looking for a traditional memoir, certainly worth the read. What have you read lately? Let me know any recommendations you have!